Sweet little kittens sit among winter’s fluffy snowflakes. 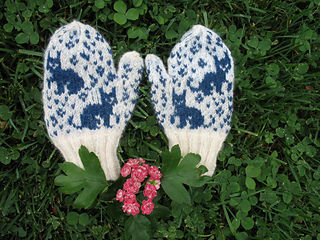 These mittens were inspired by a photo of a pair of socks for sale in Russia. The thumb gussets are on the sides and the hand decreases are swirled which gives you mittens that can be worn on either hand.